Full and half moon clips loaded with .45 ACP and one Truncated Cone .45 Auto Rim cartridge. 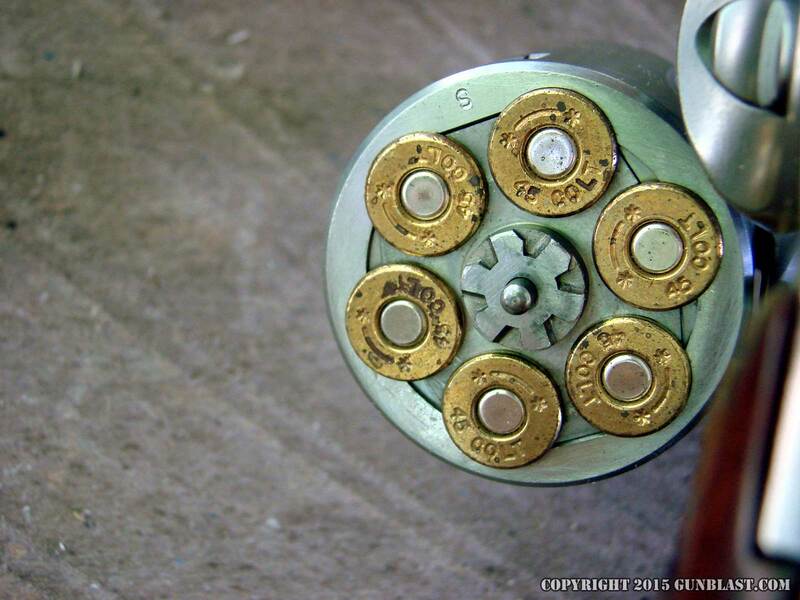 A moon clip is a ring-shaped or star-shaped piece of metal designed to hold multiple cartridges together as a unit, for simultaneous insertion and extraction from a revolver cylinder. Moon clips may either hold an entire cylinder's worth of cartridges together (full moon clip), half a cylinder (half-moon clip), or just two neighboring cartridges. 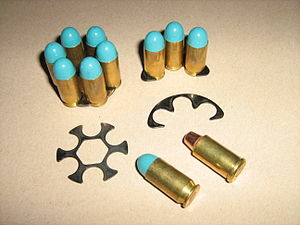 The two-cartridge moon clips can be used for those revolvers that have an odd number of loading chambers such as five or seven and also for those revolvers that allow a shooter to mix both rimless and rimmed types of cartridges in one loading of the same cylinder (e.g., 2 adjacent rounds of .45 ACP, 2 rounds of .45 Colt, and 2 rounds of .410 in a single six-chamber S&W Governor cylinder). 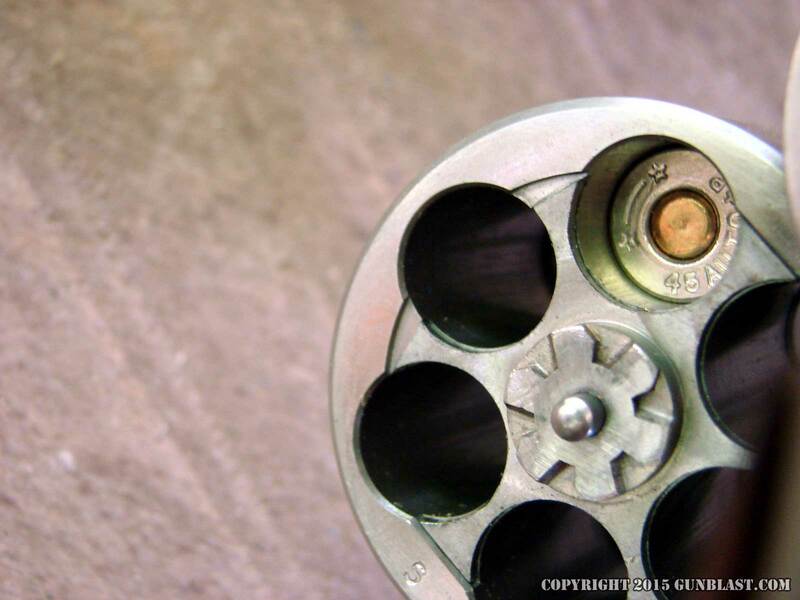 Moon clips can be used either to chamber rimless cartridges in a double-action revolver (which would normally require rimmed cartridges), or to chamber multiple rimmed cartridges simultaneously. Moon clips are generally made from spring grade steel, although plastic versions have also been produced. Unlike a speedloader, a moon clip remains in place during firing, and after firing, is used to extract the empty cartridge cases. The modern moon clip was devised shortly before World War I (circa 1908). The device then became widespread during the war, when the relatively new M1911 semi-automatic pistol could not be manufactured fast enough for the war effort. The U.S. War Department asked Smith & Wesson and Colt to devise ways to use the M1911's .45 ACP rimless cartridge in their revolvers. The result was the M1917 revolver, employing moon clips to chamber the military-issue .45 ACP ammunition. 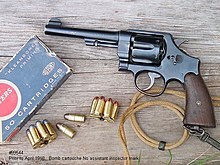 Smith & Wesson invented and patented the half-moon clip, but at the request of the Army allowed Colt to also use the design free of charge in their own version of the M1917 revolver. Moon Clips can be formed by stamped high carbon steel, heat treated and finished to prevent rust. Alternatively they can be made from pre-heat treated stainless steel and cut out using either wire EDM or Laser machinery. They can also be made by injection molding plastic. Each process has its benefits and drawbacks such as cost and durability. Moon clips can even be faster to use than a speedloader with the proper training. Jerry Miculek, a IPSC revolver shooter, has demonstrated the ability to fire six shots from a .45 ACP revolver, reload, and fire six more shots to the 6×11-inch A zone of an IPSC target at 15 ft (4.6 m) in under three seconds. This feat was possible by using moon clips to allow quick and reliable ejection of the fired rounds, and a quick reload of all six chambers at once. 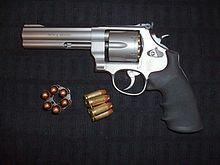 Smith and Wesson Model 625 .45 ACP moon clips. 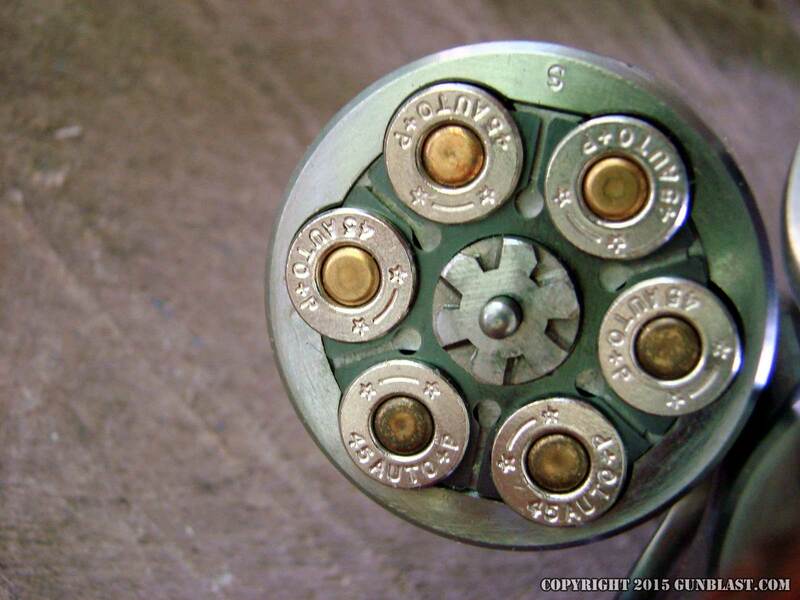 ^ Josserand MH, Stevenson JA: Pistols, revolvers, and ammunition. New York, Bonanza Books (a division of Crown Publishers), 1972, p. 143, 263. ^ Petty, Charles E. (2004). "How fast is fast? Gentleman Jerry Miculek tackles McGivern's record". American Handgunner. July–August. ^ "Ruger Introduces .45 Auto / .45 Colt Redhawk Revolver". Ruger Press Release. 2015-06-15. ^ "Ruger Announces .45 Auto / .45 Colt Redhawk Revolver". American Rifleman. 2015-06-15. ^ Johnson, Richard (2015-06-16). "New Ruger Redhawk in .45 Colt/.45 ACP". TheFirearmBlog.com.